This book was recommended to me by a colleague and after a few days it was read cover-2-cover and only now am I reflecting back on its message. First thing, the title is completely misleading. Yes the authors talk a lot about “big data”, but that I feel misses the message of the book as a whole, which is the historical look at how data has shaped our society and thinking through the ages. This book will not be read by those that think “Big Data” is just a fad and will miss some beautiful nuggets of “ooh is that how they do that”. 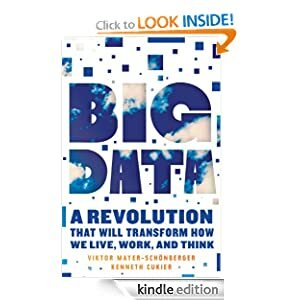 What this book illustrates very concisely is that “big data” is nothing really new, it is something that ever since the first printing presses start mass producing books, we’ve been living with the question on how do we use and apply more and more data. It mentions the paradigm N=all which in geek speak is a way of saying that technology (storage and processing) has allowed us to look at every single piece of data and no longer tolerate sampling data looking for trends and making guessestimates. There are great stories on how UPS saved over 3,000,000 miles a year from its fleet by looking at all the data (route trucks by making more right hand turns to reduce the traffic accidents). How our shipping lanes evolved to take account of weather patterns. How flu hot spots were identified by looking at search patterns. How historical flight data with weather data predicts when flights are going to be delayed. There is a wonderful story on how the designer of captcha used that technology to help Google identify words in the books it was using for scanning. Each story highlights a new way of looking at data that was once first useless and dated. It does point to the fact that humans aren’t as individualistic as we may like to think. Overall this is a great book to make you think about your data as a whole and who and what is using it.